Blogging - How can it help you Grow your Business? Blogging, or weblogging, is growing in popularity by leaps and bounds, and is not going to go away anytime soon. One is the personal blog. It's basically an online diary. Most personal blogs are the author's own observations, ideas, rants, recommendations, - whatever one wants to write about is fair game. You can use a personal blog to keep up with your family, record your travel journeys, discourse on politics, anything. Two is the business communication blog, or intra-company blog. These are used by companies big and small to facilitate communicating with others working for the same company or on the same project. It's easier than sending forty email messages. Companies can use a blog as an online newsletter, a project notebook, a place to highlight accomplishments, or even as a "what's up today" alert. The third type of blog is the marketing blog. The marketing blog is used to promote a company's products or services, communicate with customers (and hopefully prospects), and to help in relationship building in the impersonal online world. A marketing blog can also increase web traffic (and thus increase revenues). It can help with branding, or creating an identity for your company. If you have a small or home business, you can promote it with a blog. You can let visitors to your blog know when you've posted new content or added new products, and they can link right to your website to see for themselves. You can also use newsfeeds like RSS or XML feeders to notify your readers when your blog has a new posting. Those little orange boxes you see on websites, like this are newsfeeds, and basically, if you use newsfeeds, you can pick your favorite sites (no more bookmarking) and receive updates on a regular basis, either via My Yahoo! (Google and MSN also support free newsfeeds), or via free news readers. You can also self-promote your blog by telling people about it in emails, ezines, and your website. Here's a blog that I write on hotel sales & marketing. You can create your own blog, truly in just minutes, for free, at Blogger. They have a tour that explains things and step-by-step instructions. And, if you don't like it, there's a delete button and you can delete and start over! If you'd like to know more about blogging, this Wikipedia article has great information on the history and growth of blogging, as well as links to blogs of various types. 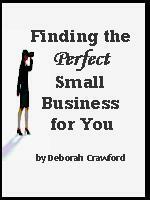 Finding the Perfect Small Business for you ebook will guide you through choosing a business that fits your life and is based on your interests. Includes how to avoid scams, essentials for your home office, and 25 easy-to-start small business ideas. Looking for a website for your small business but don't know how to make it happen? Solo Build It! is the recognized leader and the very best in building websites for non-programmers (like me).